Amidst the glory of the splendid blue-hued Nilgiri Mountains in Tamil Nadu, lies the fascinating little town of Ooty. The quaint green paths, overshadowed by towering pine trees, remind you of an English countryside. The charming colonial-era bungalows are a symbol of the rich history of the tiny hill town. Enjoy a grand boat ride at Emerald Lake together, take a toy train ride, marvel at the scenic beauty of the countryside from the various viewpoints and spend some great moments of togetherness trekking through the wilderness. Explore with beautiful hill town with Ooty Honeymoon packages from SOTC. There is no better way to celebrate love and union of two people than in Ooty, that’s why it is one of the best honeymoon places in India. The romantic weather and beautiful landscape of this place perfectly complement the celebratory marriage mood. You can visit the beautiful tourist attractions and enjoy quality time with your better half here with Ooty tour packages. 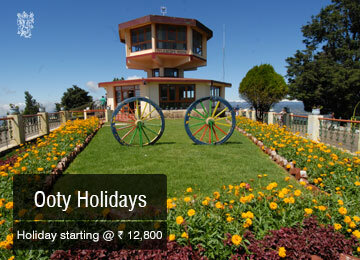 Ooty is one of the most popular destinations featured in the India honeymoon packages. Ooty tourism has boomed due to its great popularity as a honeymoon destination. The Botanical Garden and Rose Garden are home to a variety of species of flora. The boat house at the pristine Ooty Lake provides breathtaking views and even features a mini train. The mini train ride is one of the most enjoyable experiences and things to do in Ooty. If you are curious about the process that your favourite tea undergoes before reaching the shelves, do visit the Dodabetta Tea Factory. The irresistible aroma of the freshly brewed tea can be sensed from a distance. Also, make sure that your shopping bags contain a box full of delicious chocolates from Ooty before you head home. Explore this tiny Raj-era hangover hill town on your exciting Ooty holiday packages. Enjoy a blissful boat ride with your loved one on the pristine Ooty Lake. A treat to the eyes, the Doddabetta peak offers stunning views of the surrounding countryside. Enjoy great moments of blissful togetherness with you beloved, while watching the sunset at this majestic peak. Emerald Lake is an exquisite lake in the upper plateau region of the Nilgiri hills. Marvel at the beauty of this beautiful lake with your partner. It is one of the best places to visit in Ooty. The best time to visit Ooty would be from October through June, as both the winters and summers are pleasant. Avoid monsoons as the rains are heavy and sometimes causes landslides. Explore the beauty of this tiny jewel and make your honeymoon truly memorable with Ooty honeymoon packages. Soak the history in vibrant Jaipur, camp in the beautiful jungles of the Ranthambore or enjoy the picturesque views of the distant mountains and streets lined with colonial buildings in the quaint town of Dalhousie. Speak to the travel experts at SOTC for the best honeymoon packages. 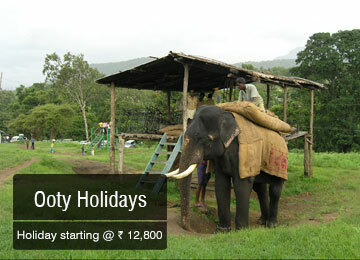 Also, browse through our exclusive India honeymoon packages to explore the best places in India. A variety of teas flourish on the plantations scattered around Ooty and taking a tour of these tea plantations makes for an enlightening experience. Depending on the time of year, you can see tea buds being cultivated and harvested. Sampling tea at the town’s tea plantations is a year-round activity! Handmade chocolates are a sweet and popular indulgence in Ooty. Don’t forget to taste them and carry some home. Make sure you try some delicious baked goods from some of the famous bakeries of Ooty. Try horseback riding at Ooty. It can be a very memorable experience on your honeymoon.